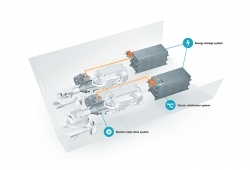 Following an announcement by Volvo Penta that it will provide electrified power solutions for marine applications by 2021, the company has revealed details of a hybrid-powered Inboard Performance System (IPS) concept. Designed to enable zero-emission operation in environmentally sensitive zones, the hybrid IPS has also been designed to offer lower noise, vibrations and running costs. 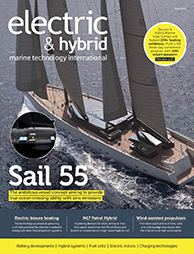 Speaking exclusively to E&H Marine at Electric & Hybrid Marine World Expo 2018, held in Amsterdam, the Netherlands, Niklas Thulin, Volvo Penta’s director of electromobility, revealed that the hybrid IPS is initially for the company’s 8-13-litre engine range, which makes it suitable for powering vessels such as ferries, pilot and supply boats, and yachts. Using technology first developed within the Volvo Group for its land applications, the new hybrid IPS concept features a clutch and electric motor positioned between the engine and the IPS pod. The electric motor is supported by scalable lithium-ion battery packs that can be charged externally using AC or DC chargers, or recharged using the primary diesel engine. The hybrid IPS is currently in early-stage development, revealed Thulin, with the system being validated at the company’s test centre in Gothenburg, and a test boat planned to enter sea trials in early 2020. The hybrid IPS will be available to commercial customers in 2021, followed by a leisure boat option soon after.